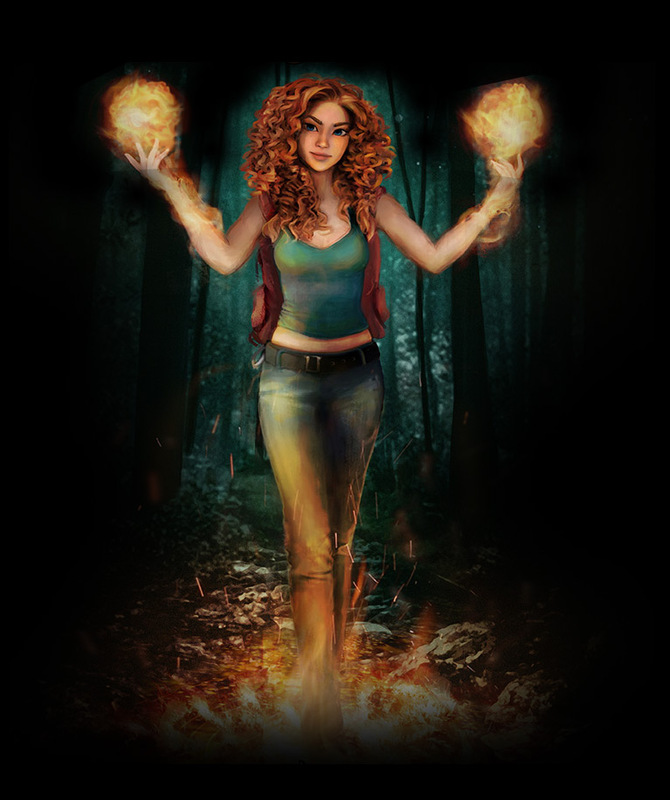 Flame-haired Zara is strong-willed, courageous and self-reliant. Nothing fazes her and she’s not frightened of a casual zip wire ride through the Northumbrian forest. However, her confidence can be over-powering sometimes and she is constantly being grounded by her parents for arguing with her sister and leading her astray. She’s quick-tempered, but also easily pacified. She’s a natural leader and the perfect choice to lead the first mission into Hadrixia. Fergus is tall for his age, loves sports and works out regularly in the gym. He’s physically strong and is incredibly proud of achieving a black belt at Taekwondo. He’s Captain of the school football team and spends his weekends chasing extreme sports instead of studying. However, at home he’s side-lined in favour of his two younger half-brothers and struggles with the fact that history seems to be repeating itself when Zara is chosen as their quest’s leader and he continually questions Max’s choice. With flowing golden waves and a manicure to die for, Aimie is calm, caring, a great communicator and loves rehearsing for her next role at drama school. She’s a home bird, happy to spend hours in her pristine bedroom chatting to friends about the latest fashions, experimenting with new cosmetics, and gossiping about celebrities. She’s also a diligent student, her homework is always in on time, and she loves reading. Like her mother and younger sister, she hates dirt and clutter, and her worse nightmare is going camping. She can’t believe her parents have insisted on her giving Star Camp a try – there’s nowhere to plug in her straighteners… and don’t even mention the toilets! Oscar is a daydreamer. School for him is boring – there’s nothing worse than being forced to read about the world and its inhabitants from dusty old text books instead of experiencing it for real. He loves Scouts and his favourite kind of weekend entails jumping into his family’s campervan with his brother Archie and heading off for a stint of orienteering and communing with nature. He loves animals, plants, astronomy and camping in the wild. He is sensible, practical and patient, but easily diverted when there is an interesting specimen to study. Wil is a gaming maestro. His best friend is his PC and his worse nightmare is spending time in the outdoors. With his father working away for extended periods, he’s the only male in his household with his mum and three very vocal sisters who don’t understand his need for peace and solitude. His world revolves around his extensive collection of comic books and dreaming up strategies for his next virtual mission. He loathes all sports but loves gadgets and tech of every kind, even to the extent of building some of his own. He’s horrified when he’s dropped him off at Star Camp and there’s no wi-fi. Jasmine is athletic, a talented gymnast who’s forever competing with her cousin Alexa to win the next gold medal. She’s dexterous, adaptable and a team player who is happy to take direction. She excels at every sport she puts her mind to; hockey, tennis, volleyball, netball, but loves the tactical side of the games she plays. She’s an only child, indulged by her parents, the ‘star’ in the house which embarrasses her when she has friends round. She’s prone to scatter her belongings far and wide and her bedroom is littered with books, sports equipment, discarded clothes and trainers, and she’s forever being told to tidy up. With spiky blonde hair and elongated earlobes, Quinn Hadricus is marked out as Maximus Hadricus’s youngest son. In the absence of his father and eldest brother, Rufus, he is the de facto Emperor, save for the fact that Zophicus has grabbed the throne for his own. He’s determined to fight against the Dark Ruler’s tyranny and his oppression of the Hadrixian people but is naïve and lacks caution. He’s also a good friend and courageous guide on the Star Jumpers quest to locate the Stone. Exiled Emperor of Hadrixia, now known to all as the Director of Star Camp, knowledgeable astronomer and leader of star-gazing weekends in the Dark Sky Park of Northumbria. Having escaped certain death by fleeing Hadrixia, he was also able to seal the Shield of Azergrix to prevent the incursion of Zophicus’s armies into the outside world. He is wise and charismatic, but also egotistical and frustrated that he is unable to return to his beloved world to fight for its liberation. Evil warlord and Dark Ruler of Hadrixia. Cruel, demanding and devious, he directs his armies to stop at nothing until they have disposed of every last one of Max’s supporters. He has presided over the imprisonment of many of the former Emperor’s followers, and the punishment and humiliation of those cowards who have switched sides. He is volatile, arrogant and ruthless. Max’s eldest son, and his right-hand man at Star Camp having followed him through the Shield before it was sealed. He, too, is unable to return to his home and supports his father’s plan to send in the Star Jumpers to locate the Stones of Hadrixia. He’s the calming force behind his father’s increasing exasperation with their situation. Max’s only daughter, Quinn’s elder sister. A determined member of the resistance, a loyal supporter of her father’s rule, and a courageous and accomplished warrior with a wide range of abilities. She inspires hope in all who encounter her, especially her small band of friends who will fight along side her for as long as it takes to dislodge Zophicus from the throne. Max’s wife, and mother to Rufus, Sabina and Quinn, who is banished from Hadrixia Castle and all but imprisoned in her home. Supporter of Zophicus, former childhood friend of Sabina, for whom he still holds great affection. She loathes him for abandoning his support of her father and joining the ranks of the enemy. Wizard potion maker and childhood friend of Max. With a straggly grey beard and flowing magenta robes that are a little frayed around the edges, he’s the last line of defence in the battle of resistance of Zophicus’s cruel regime. His potions heal wounds and mend broken bones, but can also induce inconvenient drowsiness and uncontrollable fits of laughter in the enemy. Semyon’s son, and Quinn’s best friend and partner-in-crime, until he blew himself up after a particularly disastrous potion making session and landed himself on the Outside where he helps Rufus with organising the star-gazing sessions at Star Camp. Loved by all as a bit of a free spirit and a talented recontour. Max’s former right-hand man who turned coats when Max went into exile and now serves Zophicus.